Ward is a rare species in Florida: a resident who actually was born here. However, at the age of two he was brought north under the naïve belief that he’d remain small and cute like the baby alligators Florida tourists bring home. After growing up in Connecticut, Ward studied English Literature at the University of Pennsylvania and Kings College, London. He has worked for TV Guide Magazine, a Colorado newspaper, an Arkansas TV station, and advertising agencies in Dallas, Miami, and New York City. At one time, he lived in a funky cottage community that had formerly been a pineapple plantation. It was located on Florida’s Indian River, in a town that was once called Eden. That name has disappeared from the maps, but has been resurrected in Pariah, the first of the Zeke Adams mystery novels from Pandamoon Publishing. The Teratologist historical horror series is also published by Pandamoon. Ward is a founding partner of BPD Advertising in Boca Raton, Florida, a member of the Mystery Writers of America, and an Active member of the Horror Writers Association. His short fiction has appeared in numerous genre, literary, and mainstream publications. He enjoys reading, photography, beachcombing, kayak fishing, cat wrangling, and spending time with his wife. 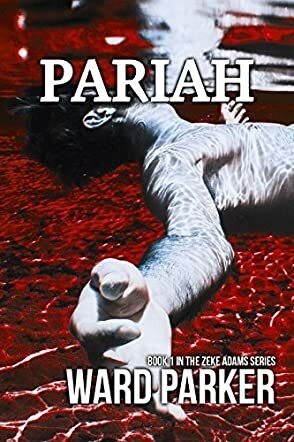 Pariah: The Zeke Adams Series -- Book 1 is a sleuth mystery novel written by Ward Parker. Zeke had had to make last minute changes to his fishing plans that morning, because Billy’s Bait Bazaar had not opened at its regular time. So, Zeke had opted for surf-casting with lures on the beach. He soon noted the excitement of small mullet as they tried to evade a predator, and figured the hit on his line was a big one. It was indeed, but Zeke wondered at the dead weight at the end of his line. As he continued to reel in, however, he came to the awful realization that he had brought in a man’s body. Were he still a tabloid reporter, he’d have instantly started taking a video in the hopes of getting it viral, but he had given up on all that and still had hopes, one day, of being respected as a reporter again. As the sun continued to rise, Zeke noticed that there were other bodies on the shore, all black, all dead. He figured they were Haitians, who routinely risked death trying to escape the violence and poverty of their island home. But how had they died? His friend, and his father’s old partner, Police Lieutenant Marie-Maude Guinard was stunned to discover that her cousin was among the dead, and she feared that her cousin’s daughter had been with her when she died. Zeke’s return home that morning quickly made him aware of the fact that a flyer describing him as a sexual predator had been placed in his mailbox and that of every one of his tenants and neighbors. The flyer was in full color and was supposedly sent by the Florida Department of Law Enforcement. It had his address and social security number on it, but a close examination of the photograph confirmed that Zeke was indeed not the man accused of molesting a child over the age of twelve. Someone who bore a passing resemblance to him had stolen his identity, but no one in the neighborhood seemed at all interested in Zeke’s protestations of innocence. He had been tried and sentenced by his former friends and acquaintances, and it seemed some would stop at nothing to ensure he left the community. Ward Parker’s Pariah had me immediately involved in Zeke’s anger over the Haitians’ deaths and horrified at the thought of how easily someone’s life could be destroyed by an incorrect accusation. While fully cognizant of the dangers children face from predators, I’ve long been troubled by the fact that the notification requirements of many states make it literally impossible for some ex-cons who’ve paid their debt to society to regain their lives and dignity. Zeke’s experiences are no exception, and his story had me remembering reading about how many ex-offenders end up homeless and unable to work as they are hounded by communities wherever they go. Parker’s story is marvelous! I fell in love with Zeke’s corner of paradise and found myself wishing he was a real landlord, who might just have a cabin available for rent in his little corner of paradise known as Pineapple Fields. Parker’s story showcases a Florida few are privileged to see, far from the glitz, glamour and ever-present condos lining much of the coast. Every so often, I get a hankering to move to Florida, and Zeke Adams certainly had me feeling that way as I read this book. Parker’s plot is canny; his writing style is a breath of fresh air, and his characters are true-to-life. Pariah is most highly recommended.